Welcome to the first farmingfriends poultry related newsletter. Thanks for signing up and I hope you enjoy reading this email. This newsletter will provide you with Spring time tips relating to ducks, guinea fowl, hens, quail and incubating eggs. If you keep a drake with your ducks then you may notice a difference in his behaviour at this time of year. You may see him chasing the ducks, raising himself up so he stands tall, grabbing the ducks by the back of their neck and trying to mount them by sitting on their backs. This behaviour is all normal breeding behaviour. 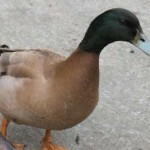 Read about duck mating behaviour. 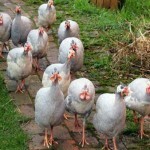 With Spring just around the corner your guinea fowl flock will be getting ready for the breeding and egg laying season. The males can be seen chasing one another about in an attempt to win the attention of any available female guinea fowl. With the egg laying season just beginning, now is the time to give your hen house a Spring clean. It's a good idea to check for mites and red mites in your poultry hut, particularly on the roosting perches and in the nesting boxes where your hens will lay their eggs. Now is a good time to think about how well protected your hens are against the threat of foxes and other predators. March is a time when fox cubs are born and so foxes will be looking for more food and so can be seen at different times of the day and not just at dusk. Think about the time that you get your hens in and try to make sure that you are not late getting them in as foxes somehow know when you are late and the hens are vulnerable. If your hens free range during the day, are they protected from predators, do you have fencing that will protect your hens against the fox? At this time of year quail start to lay their eggs. As quail are ground nesting birds it is important to make sure that the quail have plenty of new, clean straw or nesting material which will help to keep the quail eggs clean and free from droppings. Lots of straw and nesting material will also encourage the quail to lay. 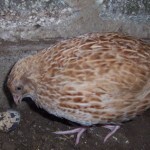 Watch out for egg eating and pecking at the eggs, if this occurs then try to collect the eggs more frequently and also try adding pebbles to the nest sites in the quail house to discourage the quail from pecking at the eggs. Cracked, poorly shaped, soiled, thin shelled, unusually large or unusually small eggs should not be kept for incubation. Only select clean and undamaged eggs for incubation. Eggs should not be washed. Try not to handle the eggs too frequently. When handling eggs make sure that hands are washed to avoid bacterial contamination. Before incubation eggs can be stored for up to 7 days. Duck, guinea fowl and quail hatching eggs will be available for sale within the UK soon so keep a look out on the website for details of the hatching eggs for sale. Don't forget you can forward this email to a friend by following the link at the bottom of this newletter and you can easily unsubscribe if this is not for you. Thanks for reading. Connect with farmingfriends on twitter. Become a fan of farmingfriends on Facebook. During February my drake, who I named Sir Francis Drake (original eh?!) has started to breed with his ducks again, so this means I will be able to sell duck eggs for hatching very soon. The quail have just started to lay on a daily basis, so I will be able to have my quail egg back on the menu at one of the local gastro pubs in our local area. The hens have moved into their own hut after sharing with the guinea fowl and the ducks. They are now laying their eggs in the nest boxes and this separation from the ducks is preventing the hens from eating the duck eggs as the hens had got a taste for eating the duck eggs. Had to take a poorly duck to the vets with suspected fowl cholera/pasteurella after she stopped eating and wouldn't leave the hut. Her symptoms included very dark green droppings and drinking lots. Vet gave the duck a steroid injection and I have been giving the duck antibiotics twice daily and she is now eating and her droppings have returned to normal. When it snowed in February, the guinea fowl did not come out of their hut as they do not like the feel of snow under their feet. Read all about it here - Guinea fowl don't seem to like the snow. A must have for all poultry keepers, it is a handy guide to ailments and illnesses. This book covers most of the diseases and ailments encountered in keeping poultry, turkeys and waterfowl. It is written in an easy to follow format describing signs, causes, prevention, treatment and mortality. It also includes many of the drugs used in the treatment of diseases. There is a list of avian vets in Britain at the back of this book and a translation of veterinary terms into plain English. There are many illustrations and photographs. 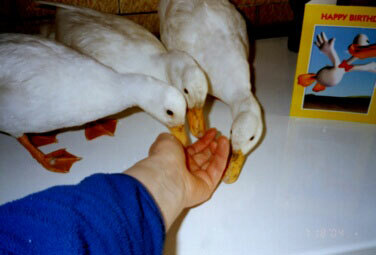 Here are Lorna's call ducks and click on the link to read all about Lorna's ducks. 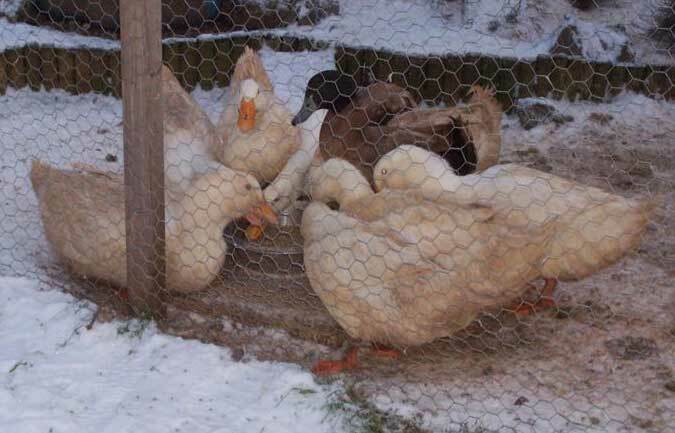 Here are Lisa's Ducks enjoying the snow, click on the link to see more of the forum members ducks enjoying the snow. There are plenty of poultry books for sale in the farmingfriends shop so click across and browse what's instore! 1) Incubating, Hatching & Raising Ducklings eBook. 2) Incubating, Hatching & Raising Quail Chicks eBook. Please email me at admin@farmingfriends.com if you would like to be notified when either of the eBooks go on sale. 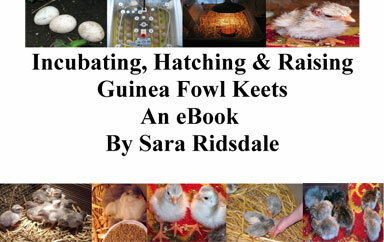 I have already written Incubating, Hatching & Raising Guinea Fowl Keets eBook priced £3.50. Gill & Anita are looking for royal purple, buff, porcelaine, opaline and bronze guinea fowl eggs for hatching in the UK. Click here if you can help. 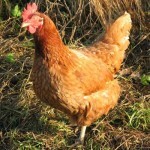 If you are looking to buy or sell poultry then check out the Farmers Market on the farmingfriends forum. Copyright (C) 2010 Farming Friends All rights reserved.